Gas burner compliant with European standard EN676. Two-stage operation. 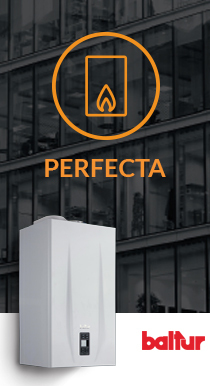 Gas burner with low NOx and CO emissions in accordance with European standard EN676: class 2. Regulating combustion air and blast-pipe. Combustion air intake with throttle damper. Air flow adjustment with mechanical cam. Combustion air intake designed to achieve optimum linearity of the air gate opening. Fully closing air damper on shutdown to avoid loss of heat through the chimney. Maintenance facilitated by the possibility of removing the combustion head without having to remove the burner from the boiler. Sliding boiler coupling flange to adapt the blast-pipe to the various types of boilers. Easy maintenance thanks to the two-sides hinge which allows the removal of the combustion head without having to remove the burner from the boiler. Device made of sound-absorbing material to reduce fan noise. CE version gas train is complete with butterfly valve, operation and safety valve with electromagnetic drive, minimum pressure switch, pressure regulator and gas filter. Possibility to choose gas train with valve tightness control. Flame detection by ionisation electrode with connector for micro amp meter. Control panel with display diagram for working mode with indication lights . 7-pole socket for burner electric and thermostatic supply. 4-pole socket for second stage control. Electrical system with protection rating IP54.